12/28/2018: Completed Tasks 1 and 3. Book Task completed previously and now claiming. Skipping the other two tasks. 3 total points for this door! glingleglingleglingle – if you could wish any kind of god(dess) into existence, what would they be in charge of? Dusting? Weeding? We’re not aiming high here… tell us! This is an easy one. I would definitely wish into existence the god or goddess (I'm not picky about gender) of "I can eat whatever I want and never get fat, and stay in supreme health." We shall call this superior being, the God (or Goddess) of Free Metabolism, and we shall worship with offerings of every possible feast known to man. Okay, the title of our God or Goddess may still be in the works. 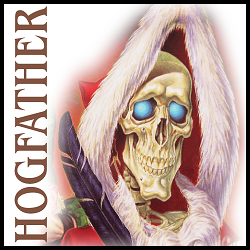 Tell us: Did you or any kids you know ever have a funny or weird (the good sort of weird) encounter with a department store Santa, um, Hogfather? Because, unfortunately, this has never happened to me, nor have I known any friends to have had a weird or funny encounter with a department store Santa. Which children’s myth / mythical character (Santa Claus, Tooth Fairy, Easter Bunny, etc.) did you never believe in even when you were little? The truth is, even as a child, we never had a lot of mythical characters talked about around the households. Sadly, there aren't any of these I ever believed in as a child, so basically the question should be if there were any mythical characters I DID believe in. My parents never purposely told us which mythical, fairy tale character existed or didn't exist, mainly because it was never a topic that came up. In the case of less fancifully fun creatures, however, I did believe that there was a monster in my closet, and a bogeyman under my bed. But that could just be a result of watching scary movies and being afraid of the dark. How that belief came about had nothing to do with what I was told as a child by parents--as I've mentioned, my parents never reinforced stories of mythical creatures of any kind. But this DID bring about the resulting belief that I needed to stay in bed, close my eyes, stay under the covers, and NOT set foot on the floor as long as it was still night time. Did I ever talk to my parents about this fear? I don't think I did. I think I felt too embarrassed, even as a child, that I truly was afraid of the monster in the closet and the bogeyman under the bed. After all, even at that age, children at school were telling me that I was stupid to believe in such things. Oh, and there was also Chinese vampire that hopped its way down the hall. Yeah... I was surrounded. 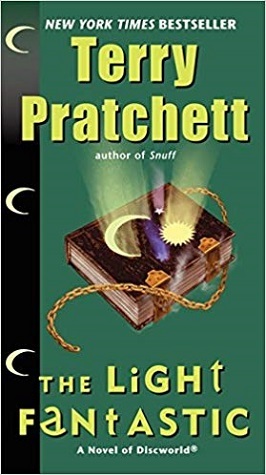 Discworld features a number of inventions that mirror our world’s technology but work according to Discworld’s very own specifications; e.g., Hex, the ant-powered sapient thinking machine (computer) and a demon-powered picture box (camera). What other invention from our world would you have liked to see appearing in Discworld and how might it have worked there? 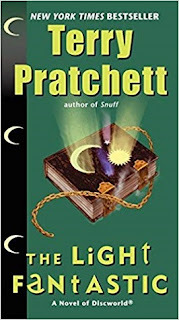 As my knowledge of Discworld only extends to the second book in the series, I truly don't know what other inventions from our world have already appeared in Discworld and in what manifestation. That being said, I can't think of anything anyway. I suppose there's always the Magical-Prodigy-Child-Elf-Powered... Homework Machine? Read for the Discworld reading group! I had fun with this one, much more than with the first book.